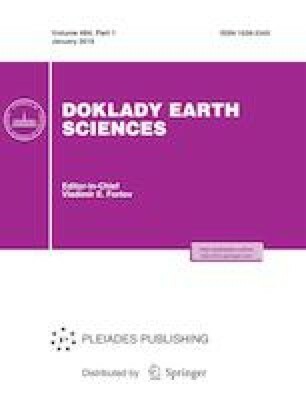 This paper describes the Se proper minerals first identified in the primary ores in Uralian volcanogenic massive sulfide (VMS) deposits. The investigation was carried out by instrumental neutron activation analysis of bulk ore samples and the mineral monofractions and also by local analysis methods: LA-ICP-MS, electron microprobe analysis, and analytical electron microscopy. СSe reaches 977 ppm in the Uralian VMS ores. A significant positive correlation is characteristic for Se with Te, S, Fe, Co, Mo, Hg, and Bi. Se is concentrated in major sulfides, mainly in pyrite (73 ppm), chalcopyrite (49 ppm), and pyrrhotite (48 ppm). Sphalerite commonly contains <10 ppm Se. The Se content is high (up to 1–3 wt %) in secondary and rare minerals of the massive sulfide ores (mainly Pb, Te, and Bi compounds): tetradymite, galena, tellurobismuthite, altaite, and wittichenite. In the ores, the Se proper minerals occur as kawazulite, clausthalite, and galena–clausthalite Pb(Se,S), and also as micron inclusions with (Ag,Cu)2(Se,S); (Ag,Pb)3(Te,Se)S; and (Ag,Pb)2(S,Se) compositions. The analyses were carried out by A.L. Kerzin (INAA), A.I. Tsepin (EPMA), and N.V. Trubkin and M.S. Nikolskii (AEM). This study was supported by the Russian Science Foundation (project no. 14-17-00693-P), while the fieldwork was performed under a state assignment of the Institute of Geology of Ore Deposits, Petrography, Mineralogy, and Geochemistry, Russian Academy of Sciences (I.V. Vikent’ev) and the Institute of Mineralogy, Ural Branch, Russian Academy of Sciences (E.V. Belogub).